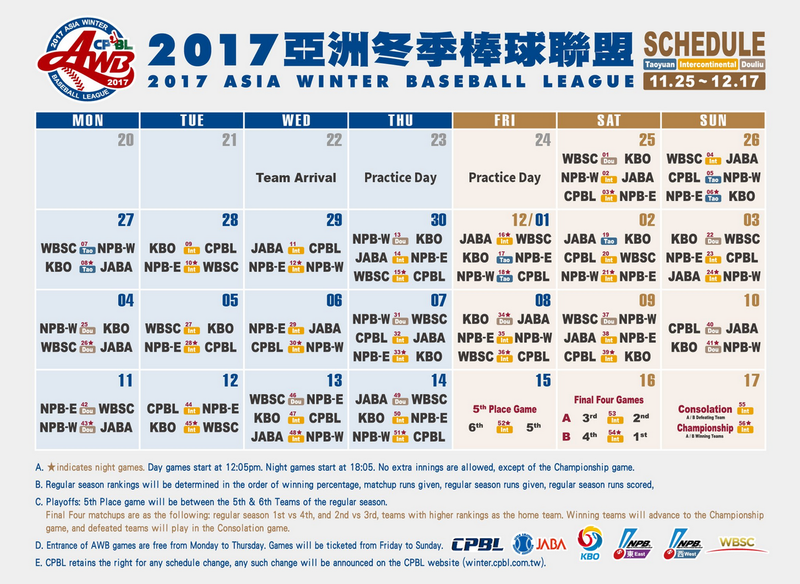 CPBL have announced their 30-man roster for the upcoming 2017 Asia Winter Baseball League (CPBL Winter League). The team is expect to take on teams from NPB, KBO, JABA and WBSC All-Star from 25th November to 17th December. The team features several young 1st team players such as 朱俊祥 (Chu Chun-Hsiang), 梁家榮 (Liang Chia-Jung) and 曾陶鎔 (Tseng Tao-Jung). Hoping to showcase themselves to the management team over the winter and get more consistent play time in 2018. With the opportunity to play against teams from NPB and KBO. CPBL teams are going all out with their prospects this year. 2017 1st round pick 廖健富 (Liao Chien-Fu) and 陳重羽 (Chen Chung-Yu) will be participating, along with several highly touted prospects like 吳桀睿 (Wu Chieh-Jui), 陳重廷 (Chen Chung-Ting) and 林立 (Lin Li). If everything goes smoothly, all of them should be the primary players of their team within the next 3 years.